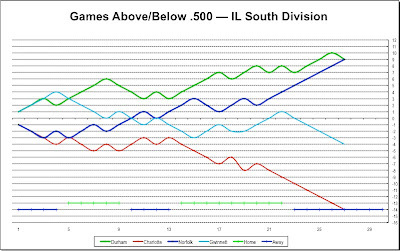 Is it time to start worrying about Jim Paduch? He is not having a very good year at all. And his pitching schedule is erratic. His best day was his first day back on April 7 when he went 3⅓ innings and only gave up two hits. He had one more pretty good appearance, then the next four have been trouble, including a gap from April 13 to April 21 another gap from April 25 to May 2. My guess is that there’s something wrong, but that is obviously guesswork. What isn’t guesswork is that the last four games he’s appeared in the Bulls have lost. That implies that (1) his luck is really awful or (2) he’s going into games that the management thinks are marginal. Last year Mr. Paduch played a vital role as a starter and general go-to guy in a year that saw plenty of struggles among the starting pitchers. This is the first year that he’s been exclusively out of the pen and it really doesn’t seem to be going all that well. To answer my lead question: Yes, it is. Meanwhile, Alex Torres had an ugly 3rd inning and the Bulls had their most lop-sided loss of the year. Today’s a new day, a new game, shake it off. While we weren’t watching, the Norfolk Tides won seven games in a row and are now tied with the Bulls for first place in the South Division. Note that Charlotte’s been having tough time of it lately. 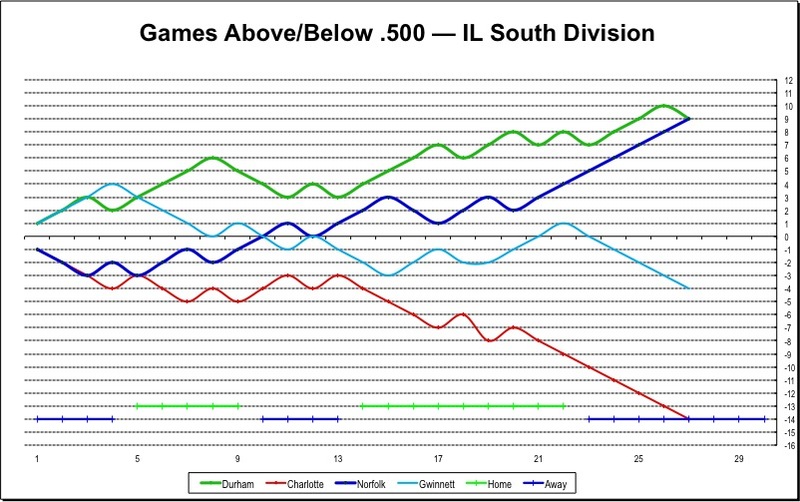 As a Cubs fan in exile I am pleased to see Charlotte defining the bottom of the chart.